Warren Heard: artist, and once Executive Chef of the prestigious Santa AnaÃ¢â‚¬â„¢s Country Club, has been immersed in Southern California culture for almost the entirety of his life. Small excursions to Europe; an effort to embrace new perspectives, practice unconventional technique, and live the lucid, romantic dream of captivating the women he loved, served as breaks to re-examine and reflect on the multi-dimensional Southern California Art Scene. Within Costa MesaÃ¢â‚¬â„¢s FIND Art Galley, layers upon layers chronicle HeardÃ¢â‚¬â„¢s extensive undulation from lower class Venice Beach resident, to upper class Chef, and finally, his ever so tragic fall into poverty. Heard claims, Ã¢â‚¬Å“For any figure, there is probably seven layers, or stages. I let it evolve.Ã¢â‚¬Â Despite covering almost every inch of the large FIND Art Gallery, it is the evolution of Southern CaliforniaÃ¢â‚¬â„¢s economy that has robbed Heard of more than half of his original art. When questioned about the missing pieces, Heard replies in a somber tone, Ã¢â‚¬Å“SoldÃ¢â‚¬Â¦given awayÃ¢â‚¬Â¦painted over.Ã¢â‚¬Â Without the resources to purchase additional canvases or space provided to fit another piece into whatever residence he had arranged for himself, he keeps reworking his originals; changing perspectives that he feels creates a Ã¢â‚¬Å“more effective and vivid narrative,Ã¢â‚¬Â for the most experienced audience to date–a result of universal technology–specifically the Internet. 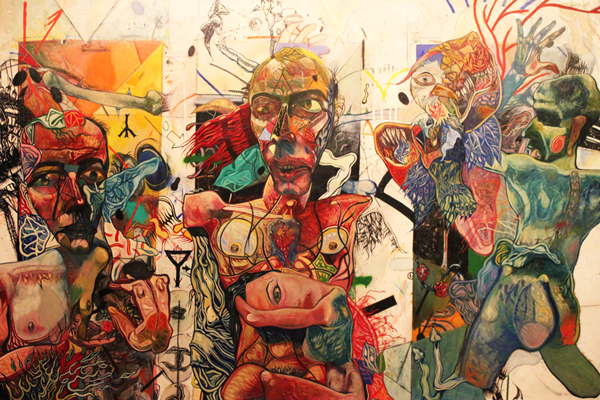 Utilizing unconventional techniques borrowed from an extensive study of inspirations such as Rick Griffin, Robert Rauschenberg, Joseph Schiele, and the Late Picasso, Heard employs a mixed media approach that is grounded in, but not limited to: oil paint, oil pastels, and Pentel markers. Furthermore, Heard paints figuratively, rendering anatomical figures and exposing an expressionistic view of the human condition. His visual rhetoric transcends any class, race, sexual preference, or creed and suggests that there are aspects of every human being that are beautiful, yet horrific. 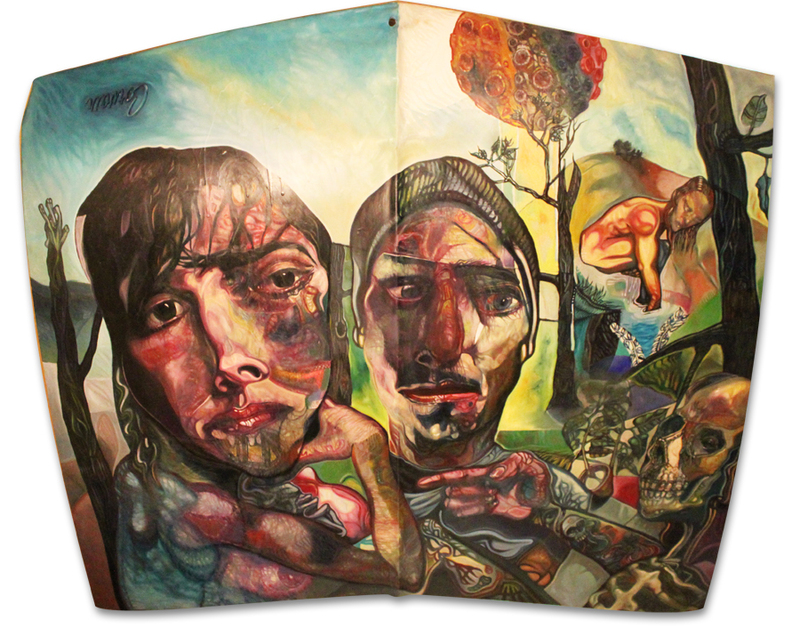 This contradiction in context with his Southern California themed setting creates a compelling argument for viewers to ponder, and promotes discussion about culture in general, which, in turn, is one of Heard’s favorite topics. We cordially invite you to see this long awaited exhibition, opening on March 12th @ 7PM at the FIND Art Gallery in Costa Mesa. 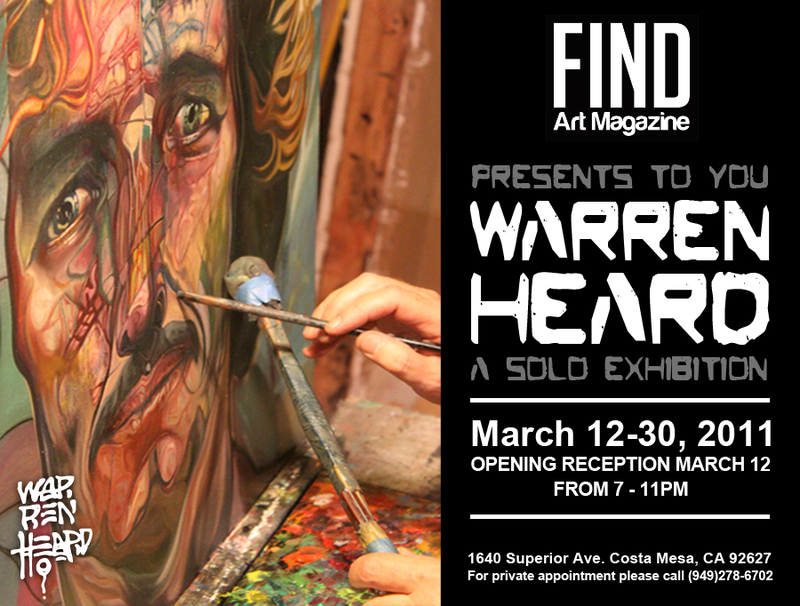 Come introduce yourself to Warren Heard, and experience the inspiring artwork that captures the beautiful, yet horrific chaos that is uniquely Southern California culture.